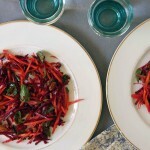 This is one of those non-recipe recipes; it’s really just a list of ingredients for a salad too stunning not to share. Plus, it’s a good way to use up all that pickled fennel I know you rushed to the kitchen to make and soon as I posted the recipe yesterday. So why is this salad so great? Well, first of all it’s drop-dead gorgeous, a 10+, for sure. It’s incredibly fresh and vibrant, not just in color, but flavor and texture, as well. It’s the kind of healthy eating that satisfies your taste buds and reminds you that winter does have something to offer beyond squash and braised meat. I think my jeans will be thankful for the reminder. The salad is about half lettuce, half goodies. 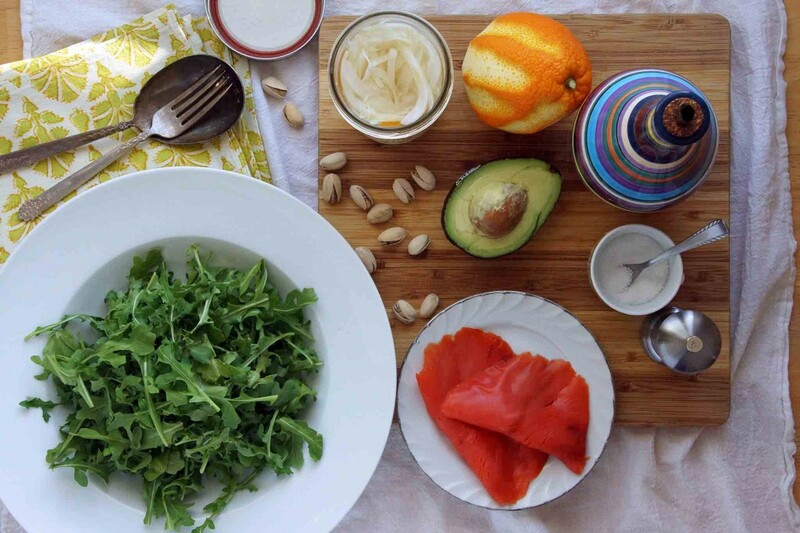 Arugula is tossed with pickled fennel, then topped with sliced avocado, orange supremes, gravlax, and a few roasted pistachios. The result is an entrée salad that you’ll be wanting for lunch everyday for all of forever. At least that’s where I’m at. 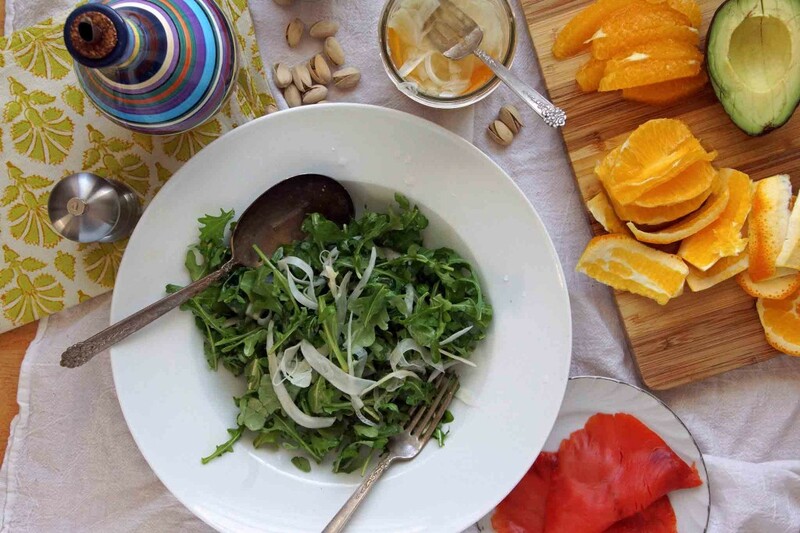 Throw a few big handfuls of arugula in a big bowl and let’s make lunch. If you’re making this salad as part of a larger meal, you may want to up the greens to toppings ratio. Now supreme an orange. This is one of those terms I’m not sure I’d know if I wasn’t a restaurant rat. An orange supreme is a segment that is just orange, no peel, no pith. To make them, cut the top and bottom off an orange, then shave off the peel, trying not to cut into the fruit too much. Now pick the orange up and cut along each line of white membrane to release pith-free segments. Side note, if you ever want to upset a cook, just walk into the kitchen while they are supreming a bunch of oranges and grab a handful of segments. Toss the arugula with a little olive oil and a pinch of salt. Now add some of the pickled fennel and toss once more. The fennel will serve as the acidic component of our salad dressing scheme. Now we’ll beautify this salad. 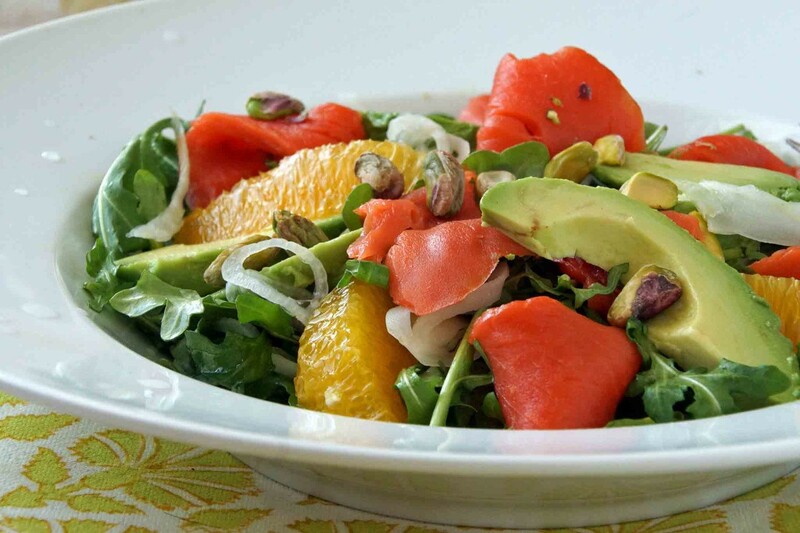 Arrange the orange supremes, pieces of salmon, and slices of avocado on top of the greens. I went for the perfectly imperfect look, but if you feel the need to make salmon rosettes, more power to you. Finish with a smattering of pistachios and grab your fork. Happy? I am! This salad delivers! It’s a total “treat” salad, with a slew of good ingredients. I love the creamy avocado and the silky salmon against the sharp pickled fennel. 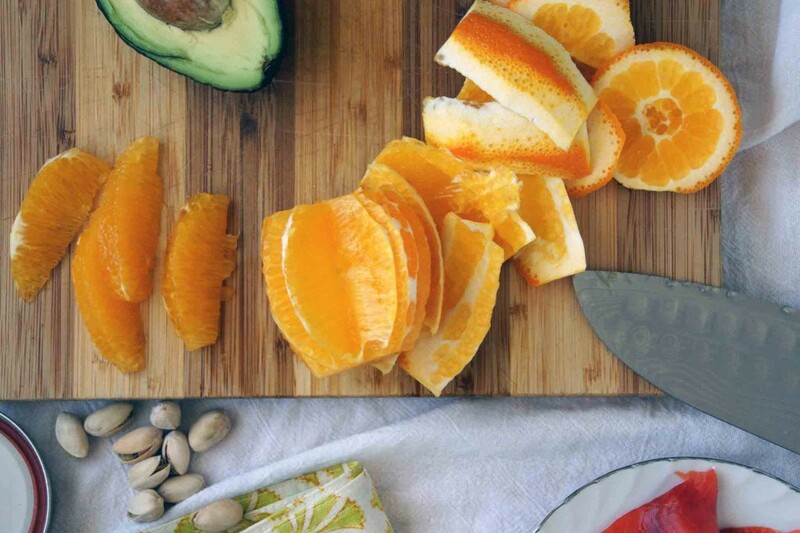 The oranges add a burst of juicy brightness and the crunchy salted pistachios are the perfect finishing touch. 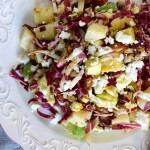 I can't get enough of this salad! The variety of flavors and textures will keep you coming back for more. 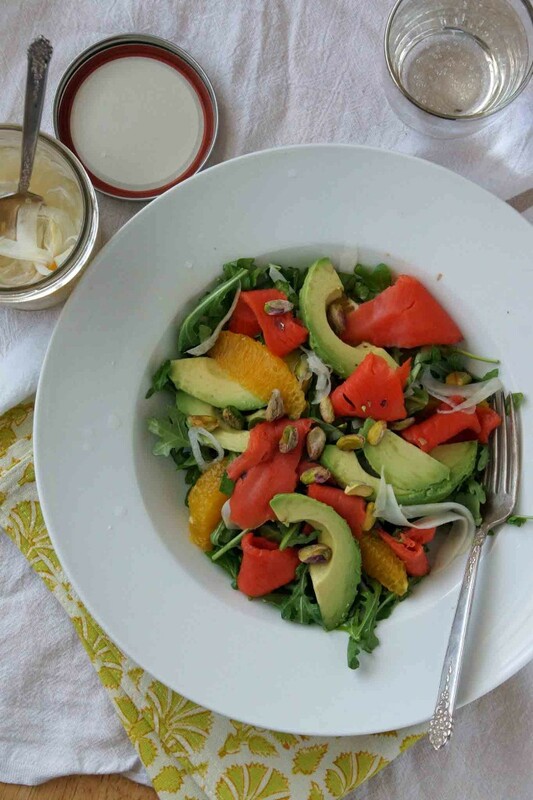 In bowl, toss a few handfuls of arugula (per serving) with a drizzle of olive oil and a pinch of salt. Add a few forkfuls of pickled fennel (let most of the brine drip off) and toss once more. 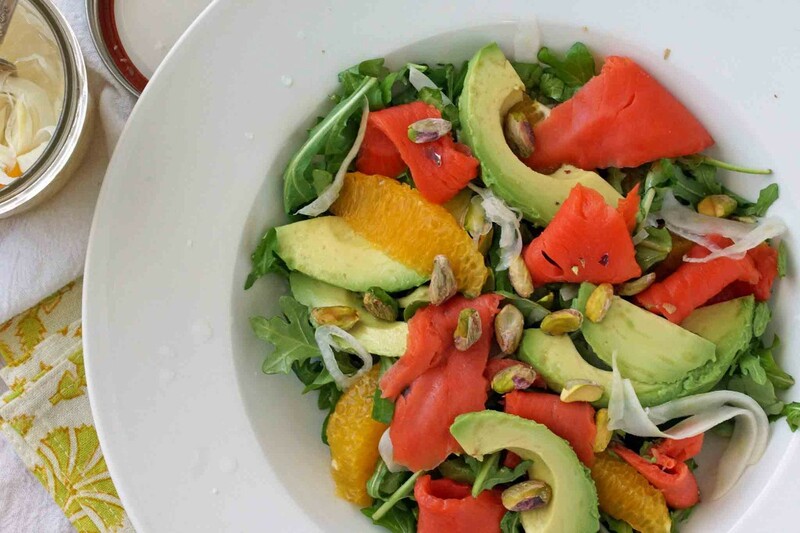 Arrange orange supremes, sliced avocado, and pieces of gravlax over the top of the salad. I'd figure on half an orange, half an avocado, and about 2 oz. of gravlax per serving. Scatter a few pistachios over the top and serve. This salad looks superb. I could eat this all day every day 🙂 I checked your roasted chicken recipe and now I know that I must do it in my new cast iron skillet. I don’t know why I waited so long to buy it but I am glad I did at last. Hope you like the chicken and hurrah for cast iron!! I’ve already eaten all of mine, but I happen to know where you can find the recipe! This salad is on another level. I love how you incorporated gravlax and pickled fennel! Thanks, Sandra! 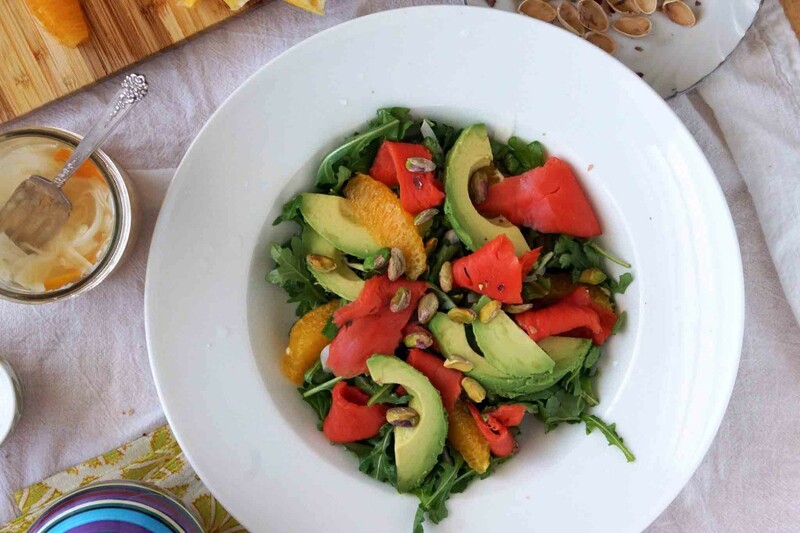 I so much more likely to eat a salad (and not follow it up with a bowl of popcorn or a stack of cookies…) if it’s pretty and full of everything I love.